With unrest spreading across the Arab world from Egypt to other countries, protesters said at least two people were killed in a crackdown on demonstrations in Bahrain. ABC News correspondent Miguel Marquez was caught in the crowd, and beaten by men with billy clubs in Bahrain's capital, Manama. The country's main opposition group, Al Wefaq, said two men were killed in Pearl Square, in the center of Manama, when riot police used tear gas and rubber bullets early Thursday to break up the protests, according to the Associated Press. Hospitals across the city were on alert for more casualties. A member of parliament later told Marquez a total of four people were killed and added that the two people killed, were shot with a shotgun. Marquez said he was not badly injured, but he was hit several times and his camera was pulled from his hands while he yelled, "Journalist, journalist!" -- trying to show he was not a protester. Marquez was on the phone to ABC News in New York when it happened. Click HERE or on video in upper left to listen to Marquez's report. "There was a canister that looked like -- No! No! No! Hey! I'm a journalist here!" he yelled. "I'm going! I'm going! I'm going! I'm going! ... I'm hit. "I just got beat rather badly by a gang of thugs," Marquez said later. "I'm now in a marketplace near our hotel where people are cowering in buildings." "I mean, these people are not screwing around," he added. "They're going to clear that square, tonight, ahead of any protest on Friday. The government clearly does not want this to get any bigger." In the spreading unrest in the Middle East, several Western journalists have been attacked. CBS News correspondent Lara Logan was beaten and sexually assaulted in Cairo on the night Hosni Mubarak stepped down as president of Egypt, according to CBS. She returned to the United States, was hospitalized and now has returned to her home. The White House said President Obama called Logan today. Earlier, ABC News' Christiane Amanpour and CNN's Anderson Cooper found themselves targeted by angry crowds in Cairo. Fox News reporter Greg Palkot and cameraman Olaf Wiig were detained, blindfolded and beaten by Egyptian military police. ABC News cameraman Akram Abi-Hanna, producer Brian Hartman, and two colleagues were carjacked and threatened with beheading. "Pearl Square in downtown Manama: Tonight, it has become the center of a growing and increasingly organized protest," he said. "There appear to be tens of thousands of protesters here. Keep in mind that this is a country of less than a million people. "The protests began Monday in mainly Shia Muslim areas on the outskirts of the city," he said. "At the time, the protesters wanted more work and opportunities from the Sunni-dominated government. "But after two protesters were killed, the crowds and demands have grown stronger and bigger." Protesters in Bahrain are demanding not just jobs but also the release of political prisoners, broad constitutional reforms and an end to the monarchy that has ruled Bahrain for 200 years. 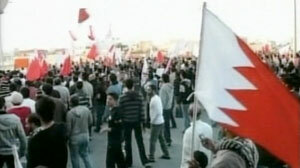 King Hamad al Khalifa went on television to call for an investigation into the deaths and ordered police to back off. "The result," said Marquez, "[is] thousands of protesters who say they won't leave the square until they get what they want. "On Friday, there is a call for an even bigger demonstration. Organizers expect tens of thousands -- maybe more than 100,000 people to show up. At this point, this protest is only growing stronger."